Info: 3BR, 3BA Property with approximately 1606 sq. ft.
Spanish Key condo for sale in Perdido Key. Beautiful 3BR/3BA Upscale Unit with direct views of the beach and Gulf in the Spanish Key Complex. One of the finest furnished units with a high performing rental history and wonderful family vacation spot. 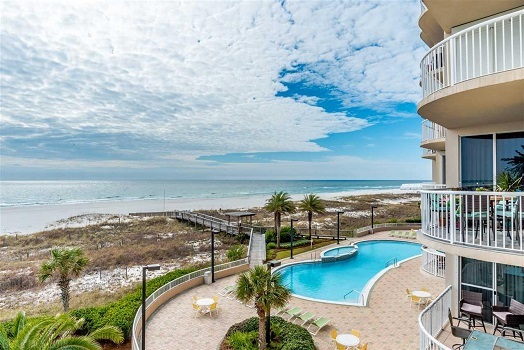 Suited for the beach life, the large unit has tiled floors throughout, a private gulf front balcony with access from the Living area and master bedroom. The kitchen features an abundance of cabinets and plenty of granite counter space. The spacious Living/Dining Room also features a Wet Bar with Ice maker for ease of entertaining. The over sized master bedroom with access to the balcony, gorgeous beach views has a master bath as well. Spanish Key community offers a large outdoor pool, indoor pool, hot tubs, fitness center, steam room, grilling/picnic area, meeting room, day use of the boat dock across the street and onsite HOA management. All of this located in a gated community on the sugar-white sands of Perdido Key close to restaurants, shopping, and Flora-Bama.